GO.123 CPS Funds withdrawal guidelines in case of Employees who died / Retired / Resigned, Withdrawal procedures for Subscribers from New Pension System(NPS) subscribers whose PRAN Number was registered and subsequently, retired/died/ pre exited. Where the employee last worked before retirement /death/ resignation may Submit the Required documents/certificates withdrawal of funds to the concerned Treasury Officer. 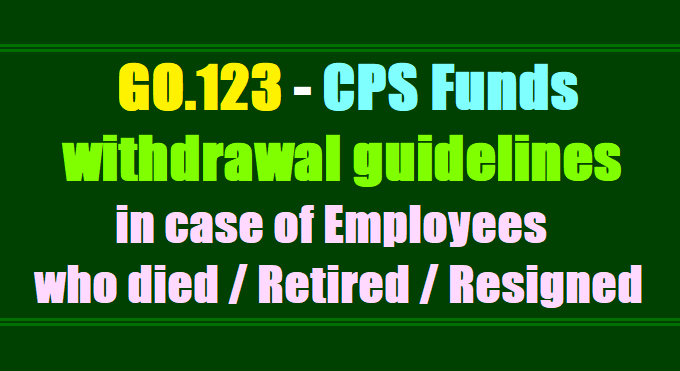 GOVERNMENT OF TELANGANA, CPS - Procedure for drawal of Funds in case of employees who died or retired or resigned before assigning a PRAN Number - Orders - Issued. 1. G.O. Ms No.62, Finance(Pen-I) Dept., dt.07.03.2014. 2. Lr.No.D1/2281/2016, Date.19.05.2017 of DTA, Telangana, Hyderabad. ORDER: In the reference 1st read above, Govt., have issued guidelines indicating the procedure for withdrawal for NPS subscribers whose PRAN Number was registered and subsequently, retired/died/ pre exited. 2. In the reference 2nd read above, the DTA has brought to the notice to the Government that some of the employees covered under New Pension System were retired from Government Service on Superannuation even without their registering with CRA i.e., NSDL for obtaining Permanent Retirement Account Number (PRAN) during their tenure in the office. 4. The Government may be decided by the competent after examining the issue hereby or authority of the er to settle the claims of such of those employees who are covered under New Pension Scheme & Retired/Expired/Exited from service before obtaining PRAN, and their contributions were credited to PD Accounts of DDOs or lying in Government Accounts. The claimants may be paid the accumulated balance (both self & Government contribution) along with interest. had died or retired or resigned without assigning a PRAN Number., as the funds are credited to the Non-lapsable Deposits and the PD administrators are Treasury Officers. i) Retirement order or death certificate as the case may be. vi) DDO wise statements showing the NPS/CPS subscriptions of the employee duly attested by the DDO concerned and the Treasury Officer concerned. B. The Treasury Officer in turn may forward to the DTA, TS, Hyderabad through proper channel with his recommendation in the prescribed format duly entering the details in a separate register. C. An adjustment bill is prepared for the total amount of employee share to be paid from the HOA 8342-117-04-001 to 8342-117-04-002. 5. Another adjustment bill is prepared for the interest on the accumulated on the funds at the rate of 8.5% per annum from the HOA 2071- to 8342-117-04-002. E. A cheque will be issued by the DTA, TS, Hyderabad in favour of beneficiary from the PD Account No.302 (8342-117-04-002) as per Treasury Procedure. F. The amount will be adjusted to the beneficiary account through RTGS/ NEFT. G. In case of employees working under Foreign Service, the request shall be forwarded through their concerned parent HOD. H. It is the responsibility of the DDO to collect details from the concerned offices based on the details entered in the Service Book. 6. Government after careful examination of the matter hereby order to adopt the above procedure, for drawl of funds in case of employees who had died or retired or resigned before assigning a PRAN Number.